Powerful Ways to Engage Your Audience Online. C&EN readers are tech-savvy and eager to get the latest information as soon as it’s available. Placing your message alongside their online alerts keeps you top-of-mind when this critical information arrives. Diverse online options allow you to reach out to the entire ACS membership, target only our most-responsive readers or appeal to specific industry segments. The first of its kind, the new C&EN Weekly Newsletter presents the latest in chemistry news to over 175,000 American Chemical Society (ACS) members and subscribers.With an open rate of over 40%, C&EN’s weekly news alert performs 3x better than industry standards. Place your messaging alongside breaking news delivered every Wednesday. Editorial content is driven by current events and relevant industry issues and trends that are of interest to our subscribers. And with our digital magazine, readers spend an average of close to 9 minutes online, increasing your ad’s exposure. 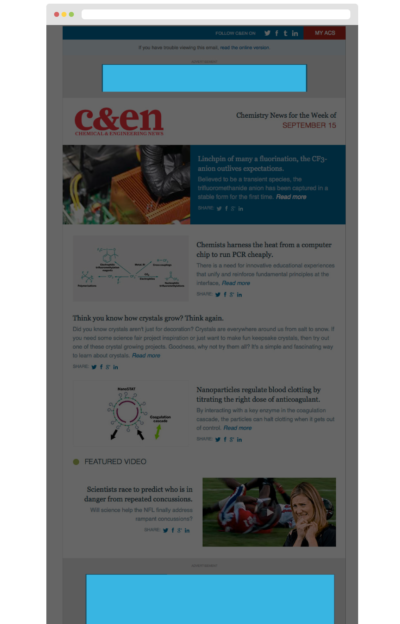 Be the first thing chemists see Monday morning, delivered to 45,000 subscribers for access to the digital edition of C&EN magazine with a 25% average open rate. 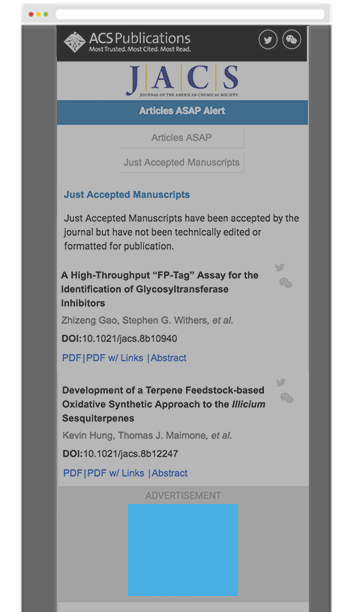 With a fresh new design, eTOC alerts for ACS Journals access more than 135,000 unique subscribers and over 869,000 email subscriptions. email subscriptions. Each ACS journal has its own weekly eTOC alert, giving you access to similar audience of our most committed readers in the academic and R&D markets, and exceptional keyword targeting capabilities. With more than 50 publications to choose from, including C&EN’s Global Enterprise, you can focus your message exclusively on the specializations that drive your business. Learn how to grab their attention – and purchasing power.